"I'll just wait here until you're ready to feed me...."
I was trying to remember what was behind my current, apparent, aversion to my 6" grid when a serendititous enquiry sent me back to my last game of 2016 which in turn led me to this comparison post which ended with the conclusion that the 6" grid was the best thing since sliced bread, a conclusion seemingly backed by an early 20thC game just before I got sidetracked by the Portable Wargame, Rough Wooing and Huzzah. It took more searching to finally find this seemingly rushed contrary conclusion, one which appears to ignore the facts presented by numerous past posts. 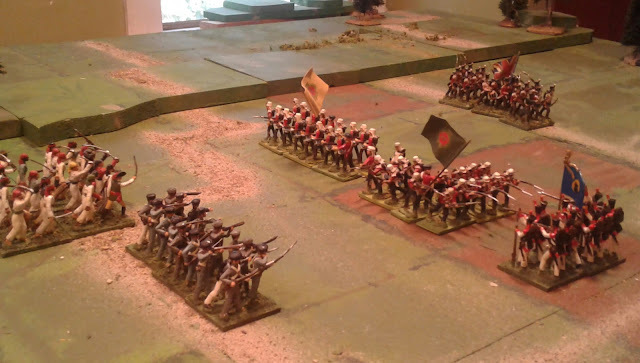 So I did some poking around and some experimenting and some reading and well, here I am, ACW back on the 6" grid for a test game with 4 stand game "regiments" each covering the ground of 2 average historical regiments in OSW, Charles Grant fashion. I even have the old ACW variant of the Square Brigadier rules buffed up to fit. Just not sure if the game will happen before the weekend. Still Struggling to Sort the Civil War. I may be impulsive but at least I've become tenacious as a bit of balance. Ever since my American Civil War armies were unexpectedly doubled by a gift five years ago I've struggled to figure out what "my ACW" is or 'should be'. I've tried various approaches and enjoyed them all but I'm not quite "there" yet. a) I want this to "feel" different from all of my other games, even those set in the same time period. b) I want to be able to use all of the painted figures in the largest games and preferably have room for a few more of the unpainted ones. c) I want the option to do both historical and non-historical scenarios. My new stonewall, and some older friends. An unofficial criteria that I was willing to consider dropping was that I wanted to have "regiments" if possible, even if just for narrative effect. Now, Civil War "battles" (as opposed to skirmishes, say, more than a Brigade a side.) ranged from at least a brigade up to several corps per side. The only sorts of wargame that can handle all of that within one system tend to either require more time, space, figures and energy than I have for medium let alone large battles or else focus on high level issues and abstract the interesting bits (for me). Still, I did at least, experiment with something nearer the original Fire & Fury with some success and did also, briefly, contemplate going back to Volley & Bayonet or something like it but neither were what I really wanted and don't really cater to smallish actions anyway. In the end it now seems inevitable that I would again go back and draw inspiration from Featherstone and from Grant and go for wargame armies that evoke their historical prototypes without slavishly following them. from CS Grant's Scenarios for Wargames. Charles Grant fielded Divisions with two Brigades each composed of just two regiments of twenty five figures each. The catch of course is that the regiments occupy too much space so the compromise gives the Division about the right frontage but the number of subdivisions do not match the historical one. This sort of standardization does simplify game design and play but doesn't seem to significantly distort the over all effect. My own armies have been organized into regiments of 3 stands with an average of 3 regiments per brigade for some years now and I find that I am now loathe to change that. It also just so happens that these regiments will (just) fit in a 4" square or hex should I go there. 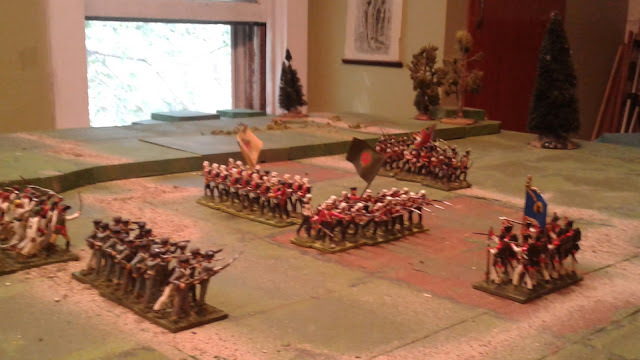 Having decided to terminate attempts to interest myself in a Brigade as Unit design, I decided to set up a CS Grant scenario at a scale of 2 of my regiments per scenario infantry unit but 4 per brigade. I started out with an old version of Hearts of Tin with a new Command & control tweak. The leading Federal Brigade was pretty badly shot up but the Confederates have still been forced to fall back from the wall atop the victory hill. The Command rule is nothing fancy but it does want I wanted at last. Each Brigade may have 1 order: Attack, Move, Hold. A die roll is made to implement the order with distance from the General being a negative modifier as is the lack of a Brigadier. Commander quality will be an optional modifier. The order will last until it is accomplished at which time it automatically reverts to Hold or until a new order is received. The system would work best if I actually wrote down orders and in a non-solo game, orders could be kept secret. A Brigade hold order allows individual units to change formation etc, shoot, and adjust their position within the brigade but not to move away or attack. A move order means move the Brigade including any appropriate formation changes to the indicated position. Once there, or if threatened by enemy it reverts to Hold. An attack order means immediately move all units directly towards the target and attack. In other words, don't issue it till the Brigade is formed and ready. A Brigade or Regiment with no order or an invalid one assumes Hold. By turn two I had again ditched the variable length moves, not because they don't work but because they slowed the game more than they added to it. By turn five I realized that the combat system bogs down a bit with dim eyes, bad lighting and units all in the same poses and uniform. There were too many dice to roll and hits to divide and track so they could be compared. At the very least I need to modify the close combats to be one unit vs one unit even if dice are traded off to neighbouring units. This is something that was MUCH easier on a grid. The alternative was a different combat system, so since I had one ready I tried that. Fewer dice, fewer hits to track and no defined winner/loser situation beyond unit morale; faster, easier and apparently, less fun. Reinforcements FINALLY arrive. I haven't played this scenario as often as my favourites but perhaps a dozen times in various peiods under various rules. Theoretically the reinforcements have a 2/3rds chance of showing up though it they might be late but experience suggests the defender is beating the odds if even 1/3rd show up before the game is over. Since technically the attacker, with nearly 3:1 odds initially falling to 2:1, wins if he is even contesting the hill, the scenario is nearly unwinnable unless you flip the victory conditions to say that the Defender wins if he is still contesting the hill. I've decided to reset into my standard brigades, revisit the old combat system which is the heart of a game really and always worked with smaller games, and start over. It might have to wait till next week though since to do a proper game with some 36 units on the table, I will need more than an hour to myself. Summer is drawing to a close and so it was that Ron and I got together again for a game. Yes, Zulus attacking Ye Olde Waterloo Farmhouse. We had started experimenting with Bolt Action last winter but not being in the mood for WW2, Ron suggested we try the rules for a Zulu War game. Neither of us like the rules for buildings very much but we are trying to restrain ourselves. We ended up counting the main farmhouse as a house but the barns as Bunkers which could only be entered or attacked through the doors though the defenders could shoot out through loopholes. The Melee "everybody dies" rule for anyone who takes even 1 hit more than they receive also didn't work for us so we had the loser test morale instead. Next time we will force the loser to retreat if they pass. The third assault finally wiped out the last defender of the barn. 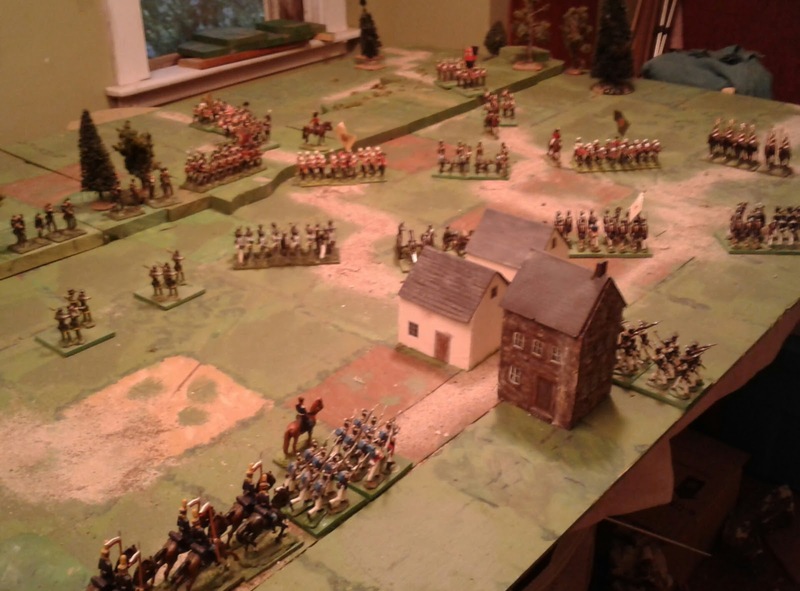 That apart, much to my chagrin, the rules rendered a fast paced, enjoyable, at times nerve wracking, Colonial Skirmish game. Half the compound is overrun but Zulu losses have been staggering. Unfortunately I was late getting there and had a commitment afterwards so had to leave just as I broke into the compound. Hopefully Ron will play out the last few turns. After Words and Fore Thoughts. So...Hooray! The Prince Michael game was as enjoyable as I had hoped, anticipated and remembered. I did discover a small problem with my new " less than a base width apart" modification to the group rule when one loose group moved in between two other loose groups and suddenly it looked like I had a great long winding group facing various directions and fighting various enemy groups. Oh! My next try will be just forbidding individuals to move to within 1 base width of another friendly figure unless joining or creating a group of touching figures. I am always thankful when I can recover from a bad decision. In this case, the conjunction of the unexpected doubling of my Elastolin collection two years ago coupled with the ever present pressure to reduce my collections to fit the available spatial, mental and temporal limits that I work within led me to err. My idea had been to finally let go of my 40 year old 25mm medieval veterans and my occasional Prince Michael skirmish games and base up the enlarged horde of Elastolins to play the battles for revived Medieval-Fantasy campaign as my only pre-gunpowder collection. It was a solid logical decision except that it neglected my emotional ties to my oldest 25's and to Prince Valiant and the transition was rushed and the newly rebased figures didn't automatically fit into the look and feel of the existing fantasy backstory had not yet shed the Prince Valiant inspired one that I had built up over the previous 6 years. The result was games without "heart" and a lack of any 1:1 skirmish games, something that is on my "one of each of these types games" list. From Saturday's game. The defenders needed GM intervention to separate an accidental merger of unrelated groups. That brings me to another, more recent bad decision which I am forcing myself to cancel before it gets out of hand. Once again this comes down to my current situation where I am trying to do more than I can handle. For some years now I have been trying to select a small number of collections and campaigns to work on to give maximum flexibility and coverage of types of games while maintaining outside commitments and making maximum use of what I already have. This is partially due to resource constraints, especially space, but also due to an awareness of less time ahead than behind and thus a desire to getting on and making the best use of the next few decades. To be more specific, last year I had decided to reduce my War of 1812 to a small, gridded (hex or square), historical, card table, game and to quietly drop my plans for a full fledged horse and musket, Imperial vs Native Kingdom, full battle, campaign. 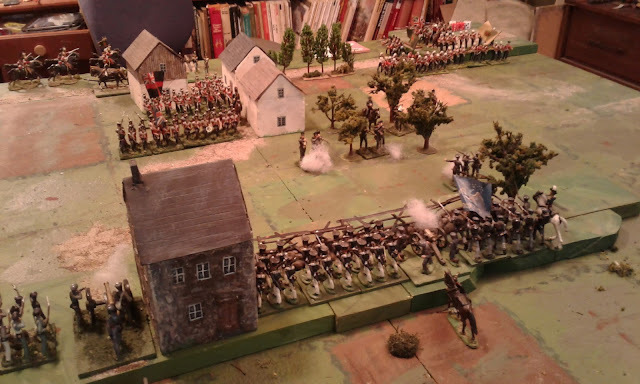 Instead I was going to keep two "battle" collections: my Prince August, Semi-flat, Not Quite the Seven Years War and my 1/72nd ACW collections and three small, semi-skirmish, collections one 40mm 1840's, one 54mm 1870's, and one 40mm early 20thC. 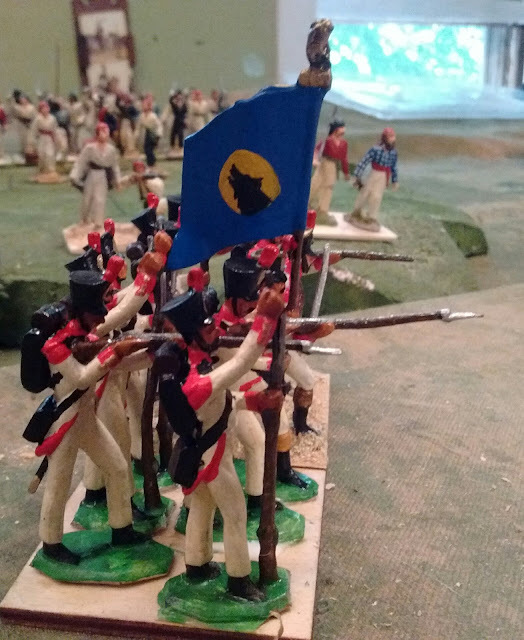 Some sort of memory lapse (I'll be kind) recently led me to start work again on the 1840's big battle Colonial wars project (the one that the disbanded Mexican War figures had belonged to...). It was the realization that my current plans implied an addition of at least 200-300 figures plus terrain and additional shelf and cupboard spaceto hold it all. Not to mention time to play the games when already I'm not able to find enough time and energy to play the other games that I want to play even more. So, (Sorry CK) it is again cancelled in favour of polishing the existing collections for small semi-skirmish games. This sort of thing is in, pitched battles in this theatre of war are out. 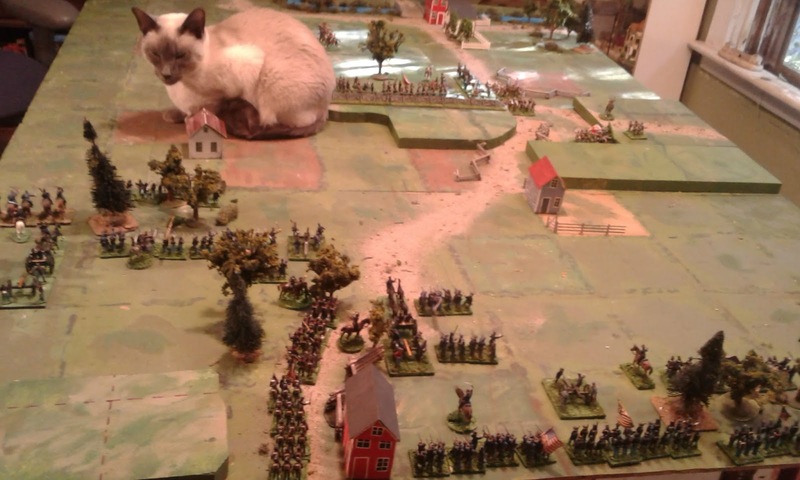 I've also decided that my ability to stage actual historical wargames has become too Iimited. At this point I can do small to medium sized ACW battles and can cobble a small 1914 game together. My 1812 collection has been stripped to the point where I can't stage a game without the 1820's and 30's troops. I was supposed to be turning the 1812 collection into an historical "cardtable" game but have backslid into once again mixing it in with my early Victorian figures for old school battles with 18-24 man battalions. That will be stopped and last year's plan enforced. Something like this 2014 Crysler's Farm game but probably on hexes. To do this I am going to turn to a grid, possibly hexes, and either reorganize into "units" of 4 figures in a single line when deployed, each representing around 200 men or 1/2 a battalion or else leave them as 6 figures in two ranks as a battalion meaning fewer game units for the same size army. With some re-painting (galvanizing?) 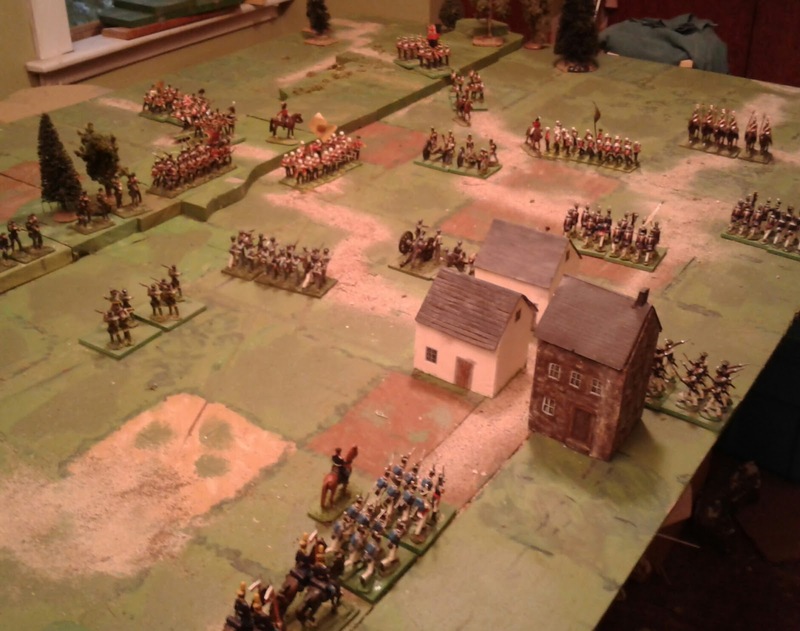 and the addition of a few more figures: chiefly gunners, cavalry and special units, I already have enough appropriate figures to do the largest battles that took place in Upper and Lower Canada at that scale. This will be a simple, Canadian history related, tabletop game, that I can 'plop' down in minutes for a visitor, especially one who is new to wargames. 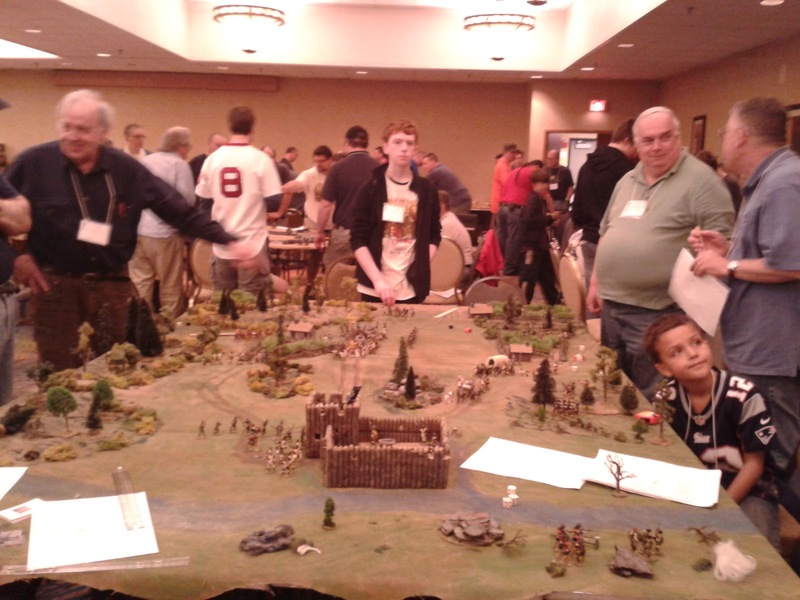 Airfix (and friends), carrying the 'conventional historical wargaming' banner. So what's next? Well I still have yet to baptize my new 1/72nd ACW stone wall. From a small patch of scrubby bushes beside the road rise a line of Saxon archers and the lead knight is struck from his horse! Wheeling quickly and drawing his sword, Micheal leads his men into the woods and cuts down the archer's Captain. These are no brigands though and fade back into the woods rather than running. As the main party arrives, yet more Saxons emerge from hiding and more arrows fly. Duke Stephen sends his sister and her baggage cart with its precious treasures, to the side of the road and starts to deploy his men. Hiding behind a low hill to the North Helgin the Saxon chief orders the horn sounded and his banner to be raised. Drawing his sword he leads his Huscarls forward to battle. 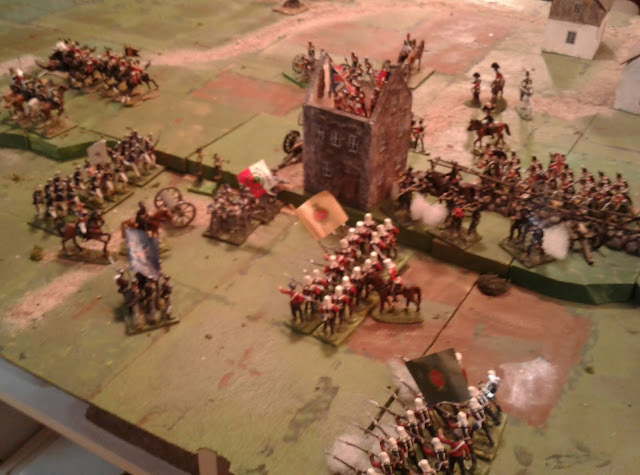 As the Duke deploys his forces across the road, both Micheal and the Red Company chase the elusive enemy archers farther and farther from the column but cannot catch them! Suddenly a horn sounds! Behind them, the Banner of Earl Helgin appears over a hill while over the hill to their front rides a cluster of Pictish knights with Dearg Mor at their head. These are no Brigands! The Red Company and Prince Micheal finally catch the enemy archers and their arrows are soon paid for. Dearg Mor does not waste time on them though but leads his party at a gallop through the hole they have left in the Valdurian line. Across the field, the Green Company holds Helgin's first assault then falls back a little to buy time and let their archers shoot. Suddenly there are battlecries and a clash of steel behind the Valdurian lines as the Pictish cavalry sweep into the thin line of guards around the baggage. At the same time the great Bull Horn sounds again as Helgin and his Huscarls sweep forward. The Green company wavers and then breaks apart. Only the Captain, his squire and one brave warrior stand to face the onslaught. The Duke and his standard bearer join the fight as Lady Katherine hovers to the rear, ready for flight should the need come. Down goes the Duke's standard bearer but the two knights and a squire hold back the howling horde of huscarles. As a fresh band of Saxons struggles over the small creek the fighting clashes on all sides, Lady Katherine leads her baggage wagon and entourage back towards safety in case the worst should happen. At every turn luck has seemed to favour the barbarians but the Valdurians are resolute. They fall back again and form a new line and their archers tear into the Saxon lines causing a number of fainter hearts to fade back from the front line. The rest pause, gathering courage perhaps before they advance again over the line of bodies. Finally, Prince Micheal at the head of the Red Company crashes into the flank of the Pictish cavalry. The fighting is fierce but the end inevitable and as Dearg Mor is pulled from his horse Helgin gives the signal to retreat. Lady Katherine will be home for Sunday dinner. With a forecast of cool and cloudy for Saturday morning it still looks good for an early game. Even if I weren't hot and tired from working outside on a muggy afternoon my upstairs game room is like a sweat box today so this opportunity is not to be lost. 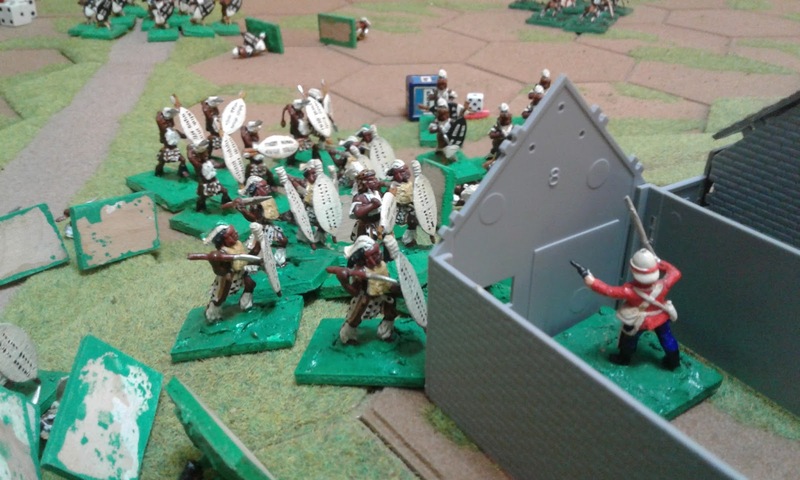 The rules I'll be using are a slight modification of Medieval Mayhem, a quick, simple set of medieval skirmish rules by Rob Dean (Sharp End of the Brush Blog) with a little input from myself. They were written for multi-player convention games and have proved themselves over and over. Not bad for a set hammered out in a restaurant and jotted down on a napkin during a power outage fifteen years ago. In 2007 they were printed in Battlegames Issue 6 and are still available as an inexpensive pdf from Henry Hyde's blog. 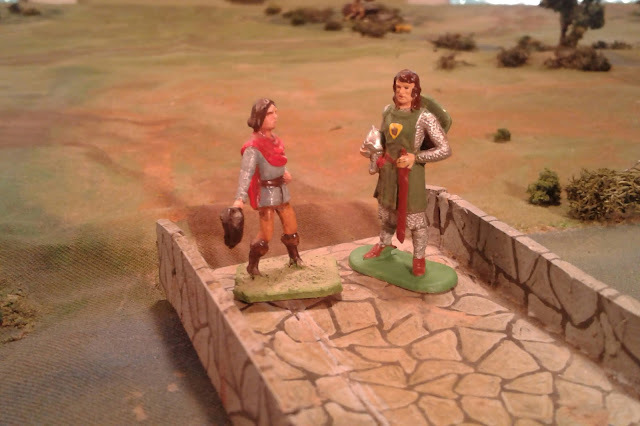 However, they were written for a Hundred Years War game and for the Accurate 54mm figures that Rob had and as such they aren't always a perfect match for my Elastolin Prince Valiant figures. I had to redefine what constitutes light, medium and heavy armour and needed to add two morale classes (veterans and civilians) but have been very restrained about other changes. 1) Groups have been redefined as having less than a base width between figures rather than physically touching. This was done largely to counter the sharp practice discovered by some of deploying figures as individuals with a mere mm or so between them so that they need not take morale checks for losses and would never all run away if charged but were still quite massed. This worked best with high morale troops or if an average group had no high morale leaders. This tweak fixes that and is easy to implement and enforce. Update. During the game, this worked up until I discovered it was not only possible to form unintentional groups but very hard to avoid accidentally forming super groups. I think a better solution might be to maintain the groups are touching rule but add a rule saying that an individual may not move to within a base width of another figure unless forming a group. 2) Groups will only test morale for losses if they take at least 10% hits. 3) If a group fails morale, individuals will test and be removed if they fail the secondary test but any remaining figures will retreat as a group (or groups if routers create a big gap). Ye Olde Cloth at Huzzah 2014. Made for Cold Wars 1998 it has seen many games, not bad value for a remnant. 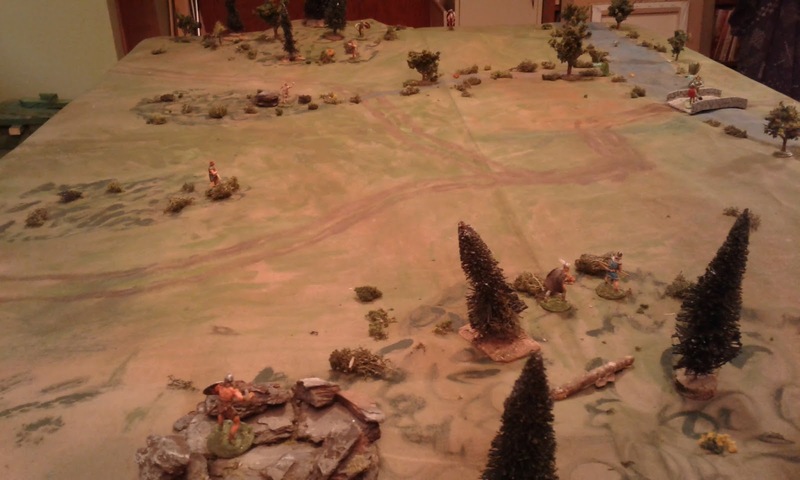 The scenario was going to be the ambush scenario from CS Grant's Scenarios for Wargames (very similar to the original Tabletop Teaser version) but I decided that I wanted to do the cloth over hills thing and it was only when I laid out the cloth that I remembered that the river half still had the converging painted roads on it from my 2014 Huzzah game. I decided to modify the scenario rather than fuss too much with the cloth at this time. There are several ways to handle solo ambushes but I've decided to repeat the method used in a Gathering of Hosts game in 2015 which keeps the player in suspense. Each turn I roll two dice to see if one, two or no ambushing units arrive then dice for each to see if they appear in the nearest, uncleared cover and shoot or charge or in the player's choice of uncleared cover. "So" said Sir Gawain to young Marten the page, "You have come with a message from Sir Hubert that the convoy with the Lady Katherine should reach the bridge on Saturday but you don't know which road they will be coming by?" "No milord" answered young Marten, "But I saw nothing on my journey to suggest that there is any danger to the convoy on either route." Very little happening here as Summer stretches on. A little puttering with new, consistent, bases for my Prince Valiant collection and some prep work on figures to finish the Wolf Regiment. However, yesterday I made the trek down to Sobey's Community Room in Greenwood to join the lads down there for some games. In the end only 4 of us showed up so we played 2 games of 2 on 2. OK, the explosion is over kill but one must celebrate one's victories such as they are and this was my only 'kill' of the day and my first battle in Space since the late 70's and Starfleet Battles. 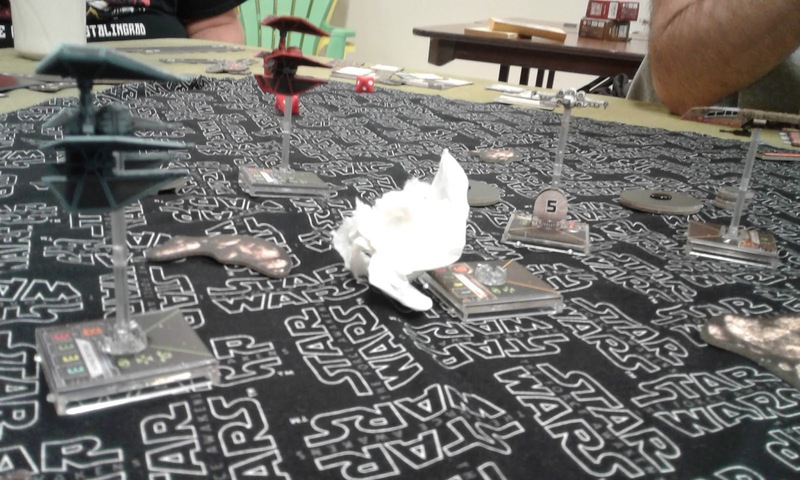 The second game, shown above, was X-Wing. It was ok. The base was sound as it used basic concepts that I first encountered in Wings of War a decade ago. However, like so many "fantasy/scifi" games today it has a strong streak of profit mongering built it with expansions, presumably limited edition, which add new features, special rules and capabilities that allow players to build "Super" squadrons for competitions so that, given equal talent, the guy with deepest pockets can grab a technical advantage. The first game, however, was Wings of Glory, the re-release of Wings of War and virtually identical and still putting the weight on pilot skill (and luck - there is no escaping the one explosion result if you pull it!). It was just as enjoyable as it was when I first played it. Not something I would go seeking to play but something I'm happy to play as a social event. Meanwhile back home, while the Elastolin are reasonably stable on their native bases, as sold, the bases are too small and the figures too light for stability in the rough and tumble of skirmish gaming. Having done some experimenting and also some contemplating on getting cheap, I decided to go buy new washers 1" wide which exactly match the length of the standard Elastolin infantry base. Two will do nicely for a figure-eight cavalry base and are heavy enough to keep the light figures stable even on a steep slope and to withstand the dreaded Domino effect. Its mildly annoying that the hardware store tends to classify wargame skirmish bases by the width of the hole rather than the width of the base, which is what really matters. Still, its not that hard to puzzle it out, esp with a sample in hand to confirm the desired weight and width. LtoR: figure base vs washer, sawdust and glue groundwork, painted, cavalry. I did contemplate buying some sort of drywall compound or similar to attempt to imitate the texture and finish of the original plastic bases and match my painted table top texture better but got home without it and decided to just press on with what I had. Who knows, table tops change, as long as the colours are reasonably close it won't bother me. 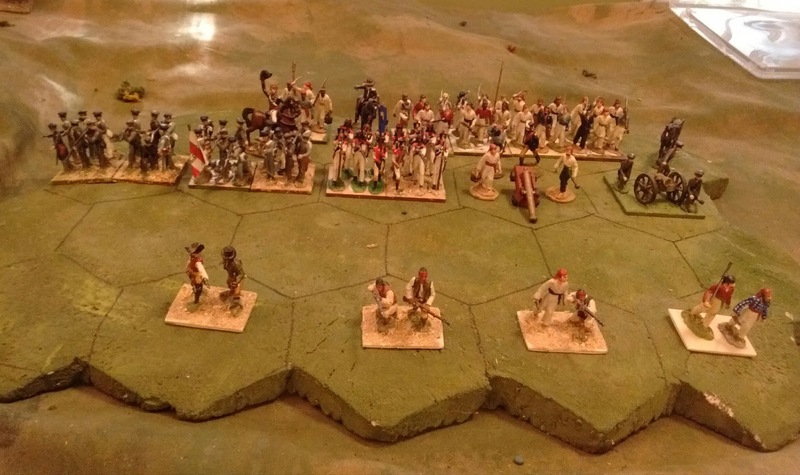 When I started my post on angles last week, I was actually planning to discuss 4 or 5 issues that I had with using any of my usual Gridded options for small battles of the War of 1812 and various mid- 19thC games using conventional sized units of 40mm figures. (I'll write more about them if anyone is interested.) The post quickly got too long so I stopped after the first, minor issue. Several times I have toyed with the idea of breaking all the usual "how to play using a grid" conventions. I hadn't really pursued it but a comment from Stu got me thinking about it again since all I really wanted was a way to measure without faffing about with my bevy of evasive measuring sticks. What I really needed to do was get away from the 1 unit, 1 grid area maxim. HERESY! Turn 1. The game begins. Blue is deployed along a ridge line with orders to stop Red's from advancing. There are two roads leading off Blue's baseline. 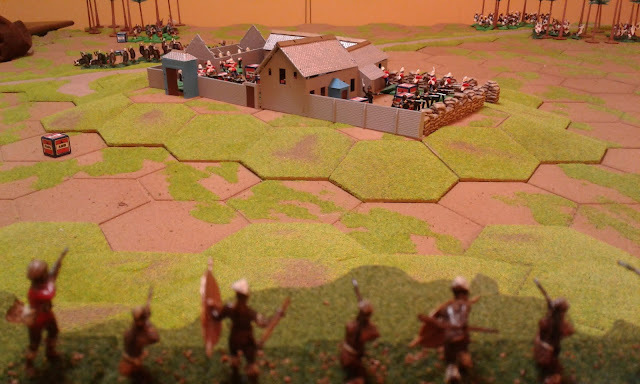 Victory requires controlling both roads at the end of 15 turns or breaking the other army. My clearly marked 6" grid is lightly/obscurely subdivided into 3" quadrants. Each 3" quadrant holds one of my early 20th Century 'companies' and that works well since they are deployed in open order under local control but one of my War of 1812 battalions need an area 3" deep and between 4" and 8" wide. None of my various attempts to deal with this quite worked for me whether by reorganizing and rebasing to turn 24 man battalions into 16 man ones in a single 6" grid square which meant most historical actions were too small to game or by breaking each battalion into several small units which just happened to be standing next to each other in a sort of dotted line which sort of worked but looked and felt wrong despite 'support' and 'command integrity' rules to encourage units to stick together. Well, I'm tired of rebasing and reorganizing want the option to have a full length game with historical Orders of Battle when I want to go there. Turn 3. Opposing skirmishers clash over a grove between the line. The Grey's have some initial luck despite the 1:2 odds but then pay for it having bought a tiny bit of time. So, I decided to let the bases sizes and units sizes be what they are and treat Units as Units regardless of how many grid squares they covered as long as they maintain a proper formation. Range and arc of fire would be determined stand by stand just like it would be off grid except that it is done by consulting the grid instead of a ruler. Movement is the same idea, no stand can move farther than its allowance. So when a line changes direction for example, one end has to move less than its allowance or the other end won't be able to move around, things naturally happen the way they happen. Apart from that the rules used were basically the latest draft-in-theory of Hearts of Tin, which is the rules set that the Square Brigadier was based on. I don't have a version written up as played to share yet but will have in a week or two. Turn 4. 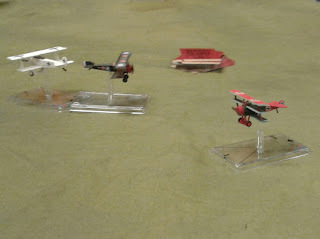 Red deploys under artillery fire. I didn't want to muck up my coming campaign so rolled back the clock to the days of Faraway and Oberhilse's Origawn War. 1st Brigade: Brigadier Wavey. 4th Infantry (3 stands), 1st Volunteers (3 stands), 1 field gun. 2nd Brigade: Brigadier St. John. Lafayette County Volunteers (3 stands), 2nd Volunteers (3 stands), Origawn Militia 1 stand, Bangor Rifles (2 stands), Mountain Howitzer. 23 stands. Break Point: 13 stands or Commanders lost. Turn 6. 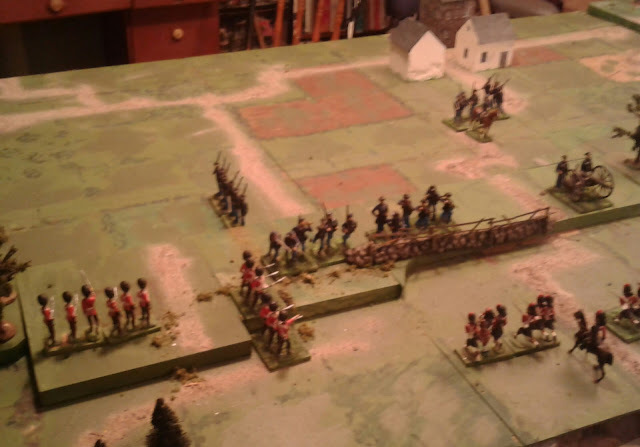 Red's plan was to pin Blue's units along the wall with the first Brigade while the 2nd Brigade turned the position but casualties from artillery and long range musketry have been heavier than expected so the elite Royal Fusiliers went in with the bayonet. 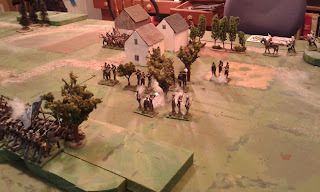 Flanking fire from the house backed by a reformed line soon drove them back but their job was done. General Turner commanded the Red Queen of Faraway's army. Princess Charlotte Dragoons: 4 stands. Advance. Brigadier Green. Victoria Rifles. 2 companies ea of 2 stands. 1st Brigade. Brigadier Spye. Royal Fusiliers 4 Elite stands, Royal Veterans: 4 stands. Artillery: A Battery RFFA 2 field guns. 27 stands. Army Morale: 14 stands & Commanders lost. So did it work? By GUM! it did, just as I pictured it. The engagement was roughly the size of many of War of 1812 battles so fits there yet still leaves me room to add a few more units. (One of my issues with my Square Brigadier version was that I already had too many figures). It took about 3 hours to play not counting set up which is about right. Sometimes a quick game is good but I have both Square Brigadier and Portable Wargame options for a quick game but was starting to run short of afternoon or evening length games and a series of short games is not the same. In addition it had the feel I wanted without needing to fuss with my disappearing rulers. 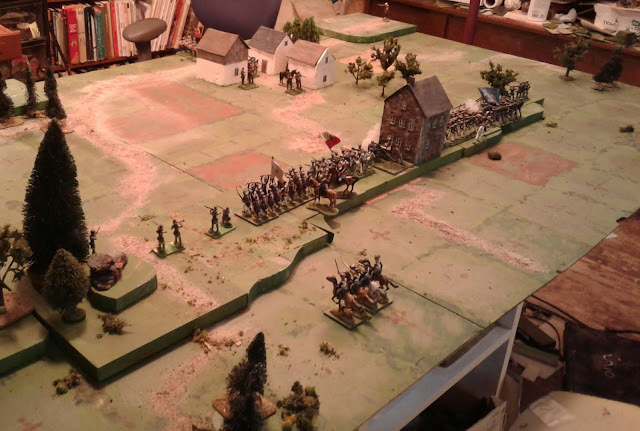 This confirms my conclusion after my last Square Brigadier and Portable Wargame games that the subdivided 6" squares are best, easiest option for my table but doesn't require compromises on organization and basing for my 1812 and mid-19thC Atlantica games. It does mean I need to get back to work on finishing hills that fit the grid and on making some of the subdivision markings clearer. Was it perfect? No, some judgement was occasional required where the grid wasn't clear or during occasional manoeuvres, such trying to track the farthest distance travelled when a unit in line changed front by less than 45 degrees, but nothing too difficult, especial when playing with an agreeable opponent like myself. I decided to add a few more units then take more picturesto help clarify the options and effects in my mind. The "Face an Angle or Edge" option. This looks the closest to what a non-gridded version would look although there wouldn't be what look like gaps in the battle line if there was no grid. 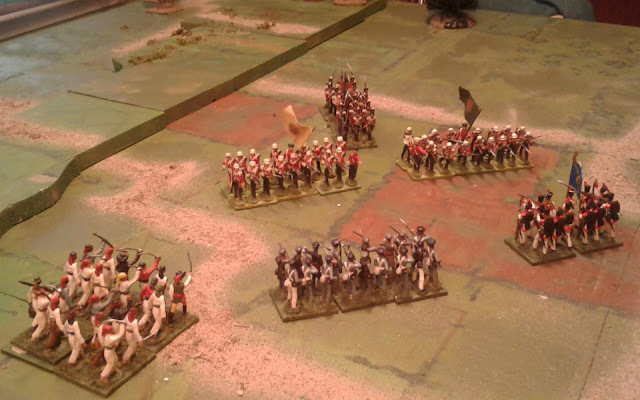 At least only the units on the ends of the battle line have a flank in the air. The "Face an Edge only option". With the edge only option I tried various times to arrange the Batleline so that each unit in both armies could cover it's neighbour's flank but was unable to do so except by proposing slightly more complex rules about when one could start relative to an enemy and move to contact a flank. I didn't pursue the "face two directions" options because the possibilities depend on the basing used whereas I wish the rules to work the same way regardless of how the units are based. So, the next step will involve laying out options for moving along the diagonal considering that a unit in line will have to pass through one or both of the intervening adjacent orthagonal squares to reach the diagonally adjacent one and rules regarding splitting fire. Hopefully some sort of game will result tomorrow. Some of you may have noticed that I haven't played a gridded game at home since early May. I was thinking about just going gridfree for a while, especially for my upcoming "more Old School" Horse & Musket games, but between my constant search for brightly coloured but periodically invisible measuring sticks and tapes during the last couple of home games and some recent blogposts on various sites about miniatures on grids and rules (including the Man of Tin Blog where it seems that I can no longer leave a comment, hopefully a technical issue...) got me thinking about my grid again as did accidentally grabbing one of my old multi-hex-hills leftover from 5 or so years ago. One of my main issues, (not one that I saw being discussed) has to do with linear, close order, battle lines facing each other across the diagonal grain of a square gridded table. A fuzzy shot of just such a situation as that described below on a 6" grid with 2 stand units. Note that the two Grenadier units are technically adjacent as are the two Blue units which are opposing them with a refused flank. Lets say you have Blue defending a ridge that runs North-South against an attack by Red coming from the West. All is fine and dandy. Then more Red troops appear in the North-West corner and Blue reinforcements moving up from the South-East corner have to rush forward to form a refused flank on a NorthWest to SouthWest line to meet them. If all movement and facing are ordinal, instead of two opposing parallel battlelines at an angle to the grid, you get a series of steps which each side having their flanks exposed to attack from either one direction or the other. If one adds some complexity to zone of control rules to allow one unit to cover you might be able to swing it but it will at the very least look odd. Another example of armies manoeuvring oddly in right angles. There is no way for the Tigers to face both enemy units. My original reaction to this was to allow units to face the diagonal and this works ok but while I was happy with my small units shooting either way when facing a corner of a 3" square, it looks wrong or at least odd with a wide battalion in line all firing at a 45 degree angle on a 6" square. It also would seem wrong for the Young Buffs in the picture below to ignore the Volunteer directly in their front across the diagonal to all fire at a slant at the Wolves which are technically at the same range. That sort of thing would call for some very careful wording or a strong sense of proper vs allowed. It was primarily these diagonal issues that had me pondering drawing hexes on a cloth. Oh and should that Royal's column be able to move through that gap between the deployed lines? It looks wide enough if the enemy weren't there to receive them. I might just start allowing columns to move on the diagonal. 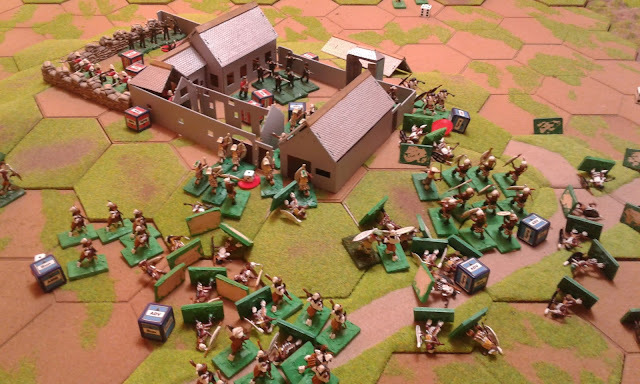 However, I think that these matters of diagonally adjacent units, target priority, and split firing units can all be handled by a combination of the use of multi-stand units with combat dice by stand and some slight rule amendments using definitions such as "Adjoining" (sharing one corner), "Adjacent" (sharing an edge), and "Engaged" (adjacent to the front of an enemy stand) . It won't completely solve the diagonal multi-battalion battle line issue, but it should get me closer. Here the 3 stand Tigers have refused a flank by turning one Stand and it is clear that one stand could fire at the Volunteers if the Wolves hadn't attacked while only the other 2 are available to fight the the Wolves who fortunely for the Tigers only have 2 stands in uniform so far. If the Wolves fell back 1 square then the Tigers could shoot 1 stand at the Volunteers and 2 stands at the Wolves. Hopefully on Monday I can give it a whirl on the existing 6" grid and then I can get back to terrain making and painting. Its summer! The weather is beautiful and the Toodoo list long, from lawn and garden to keeping SWMBO company on our grassy patio equivalent from time to time. All this has reduced but not entirely replaced my hobby and blogging time. 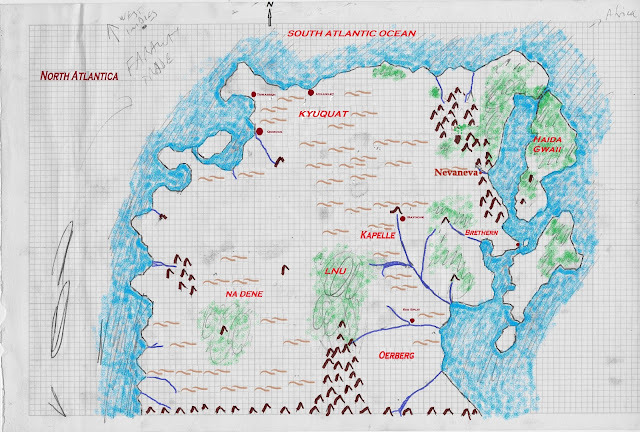 In Kyuquat (see map), a scratch force musters to oppose an impending invasion by the Red Queen. 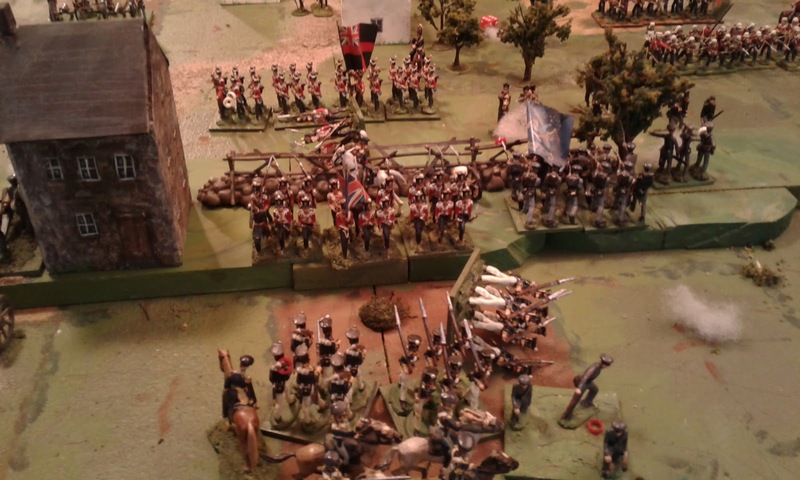 Brethren of the Coast allies provide 4 stands of skirmishers, 4 stands of massed infantry and a battery under the Black Fox. Foreign Volunteers provide a full 4 stand regiment of infantry plus a mountain gun (most still wearing various old Oberhilse uniforms...that's gonna be an issue I think). Finally there is a wing of actual Kyuquat Infantry. Its not much but it will have to do for now. Reduced time means choices so I chose to spend my hobby time on the wee troops rather than blogging. In particular I chose to paint, refurbish, reorganize, and rebase in preparation for the opening shots of the rapidly approaching 1st Farawayo-Kyuquat War. The right wing of the Wolf Regiment still in training.